[M]y mind loves to wander, and cannot yet suffer itself to be retained within the just limits of truth … [W]hen looking from a window and saying I see men who pass in the street, I really do not see them, but infer that what I see is men … And yet what do I see from the window but hats and coats which may cover automatic machines? Yet I judge these to be men … by the faculty of judgment which rests in my mind, I comprehend that which I believed I saw with my eyes. 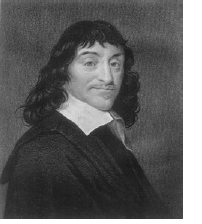 Descartes, Rene. 1637. Discourse on the Method of Rightly Conducting the Reason, and Seeking Truth in the Sciences. pp. 19–20. —. 1641 (1911). Meditations On First Philosophy. Cambridge: Cambridge University Press. pp. 14–17.